In Denis Villeneuve’s fictional “Sicario”, the drug war was not seen as something by the American side that could be “won”; it was seen as something that could merely be controlled. “Cartel Land”, on the other hand, a documentary, views the drug war as neither something can be “won” nor controlled. It’s a hopeless cause, so hopeless, in fact, that it is left to those operating outside the law – that is, “vigilantes”, to borrow the parlance of those featured in the film – to patrol lands that have essentially been surrendered to Mexican cartels running the drug war. The film was directed by Matthew Heineman and his access here is something spectacular. He opens with Mexican meth cookers, their faces hidden by bandanas, who sound as matter-of-fact about their trade as white collar criminals gaming the system. They do what they do because it’s what they have to do because it’s what’s always been done and always will be done because no one can really stop them. And Heineman takes this as gospel. He never returns to the meth cookers, not until the very end, bookending the hopelessness of all that comes between. He has no interest in documenting the actual cartels – how they are put together; how their influence stretches so wide; how they cannot be stopped. That they cannot be stopped is merely assumed. This is their land and Heineman’s film is about that reaction to it. The ensuing film then is un-equally divided between two groups, one headed up by Tim “Nailer” Foley, living in Arizona near an un-defended part of the border where he and a small band of militia have installed themselves as protectors. Meanwhile, deep down in Mexico, in the southern state of Michoacán, where cartels run rampant, a group of citizens commanded by the charismatic local doctor José Manuel Mireles Valverde take up arms, christening themselves the Autodefensas, and driving cartels out. Mireles becomes a folk hero, but just as quickly becomes an enemy, not just of the cartels but of the government who we glean is far from the up and up. Heineman spends more time south of the border and it’s easy to see why. 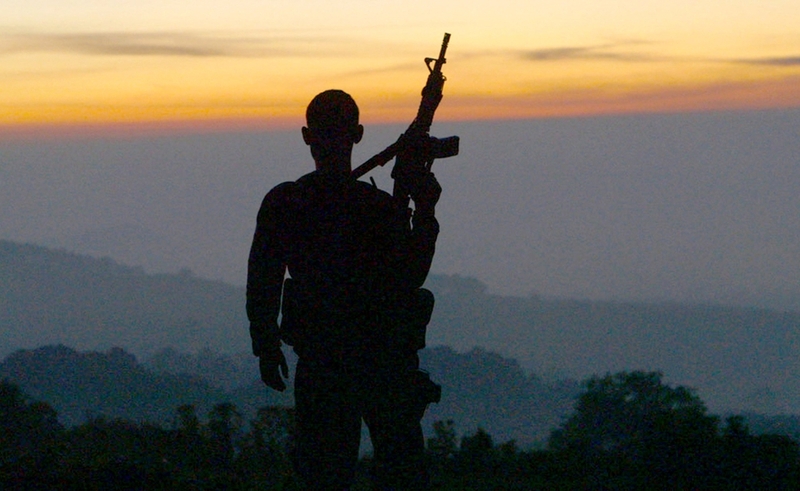 The footage here is often jolting, occasionally indistinguishable from “Sicario” save for the cinematography, and Heineman and is three other editors – Matthew Hamachek, Bradley J. Ross, Pax Wassermann – do a splendid job of presenting Mireles and the Autodefensas one way and then slowly peeling back layer after layer. What at first comes across like an implicitly noble if necessarily violent endeavor is eventually revealed as being no less morally dubious than the actions of the cartels they seek to rid from the landscape, as once-grateful locals question their methods and eventually force government intervention to which Mireles remains steadfastly opposed. North of the border, however, “Cartel Land” routinely gets stuck, with seemingly no point or purpose Nailer’s exact strategy is vaguely defined, perhaps because it really is vaguely defined, and his view of the world is never challenged like Mireles, whether Mireles knows it or not. He makes a concession early on that his views on illegal immigrants, some of whom may in fact have been simply trying to escape a lawless land where cartels run rampant, is never really followed up on, and he never entirely seems to take it to heart, simply trying to force everyone to He dismisses everyone trying to come in as invaders, and some of them might be, but others are likely simply trying to flee, and he never seeks to delineate. With a questionable compass and no destination, and with Mireles eventually going into hiding and then being captured by the Mexican government, there is no real logical end point for “Cartel Land”, much like there is no logical end point for the waron on drugs. And if you are left with a desire for a film with this sort of footage at its disposal to make a stronger statement than the “war can’t be won”, well, maybe we’ve reached the point where this is no other statement left to make.